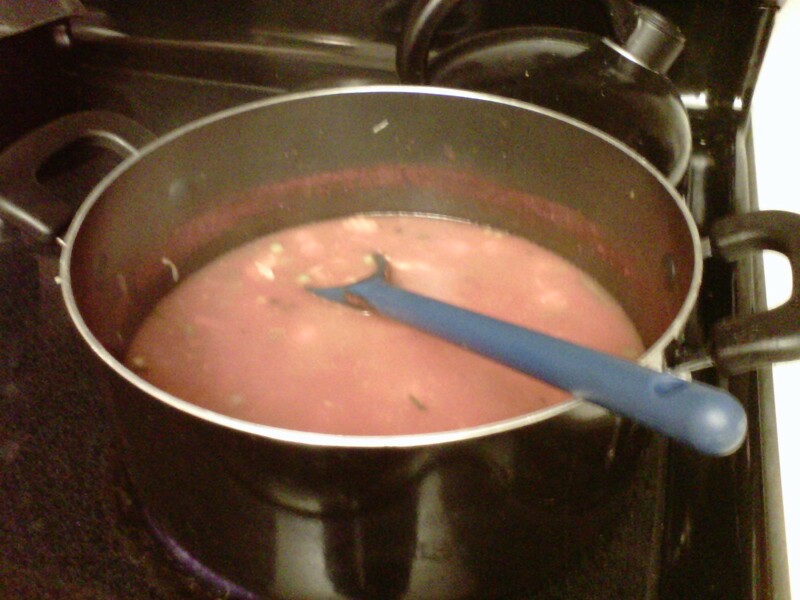 Today was another soup kind of day...and now that I am getting into this making soup thing! I decided to try out another recipe. Disclaimer - to my dear friend Jessica: don't be offended I didn't yet try your Tortilla Soup Recipe! I was trying to find one today that was similar to Avila's El Ranchito soup that I love! Next time, will be your recipe's turn! Thank you for all your awesome recipes!! More to be posted soon! Thank You About.com...Southern Food section? ?....and thank you Google for helping me find this easy recipe! Found here: http://southernfood.about.com/chickensouprecipes and slightly altered. Basically it is: open cans, pour in pot, simmer, serve! SO easy and delicious! 3/4 cup corn kernels, frozen, fresh, or canned drained ( I used a blended frozen mix with peas, green beans, and corn) aka...all the vegetables Kylie will eat! Simmer chicken stock with tomatoes, lime juice, jalapeno, green chiles, cilantro, green onion, carrots, and corn for 45 minutes (or as long as you have!...I probably only did 20 max...I think it was fine Enough time to thaw frozen veggies, heat thoroughly, and blend flavors); add chicken about 10 minutes before done. 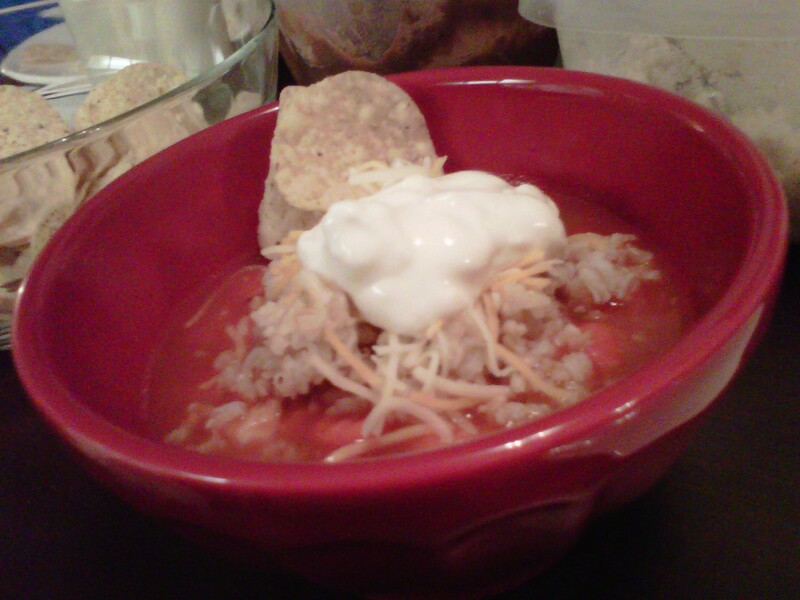 Top each bowl of soup with tortilla chips, sour cream, and shredded cheese, and rice, or serve on the side. Perhaps red bowl, red soup wasn't the best option for the photoshoot...BUT they are CUTE bowls from Anthropologie! I love them - check them out here: http://www.anthropologie.com/latte bowls and the mini ones http://www.anthropologie.com/mini latte bowls are soooo adorable!! They actually are really reasonably priced, which is rare for the amazing Anthropologie. The big ones are $5 each and the mini are $2.50 each. (some math for you: I got 4 bowls and 2 mini bowls for $25. Not bad at all!) Plus, they look much fancier than the Ikea and Albertsons bowls that join them in our cabinet! Last night, I also tried out one of the apple cobbler recipes I posted from yesterday's entry! 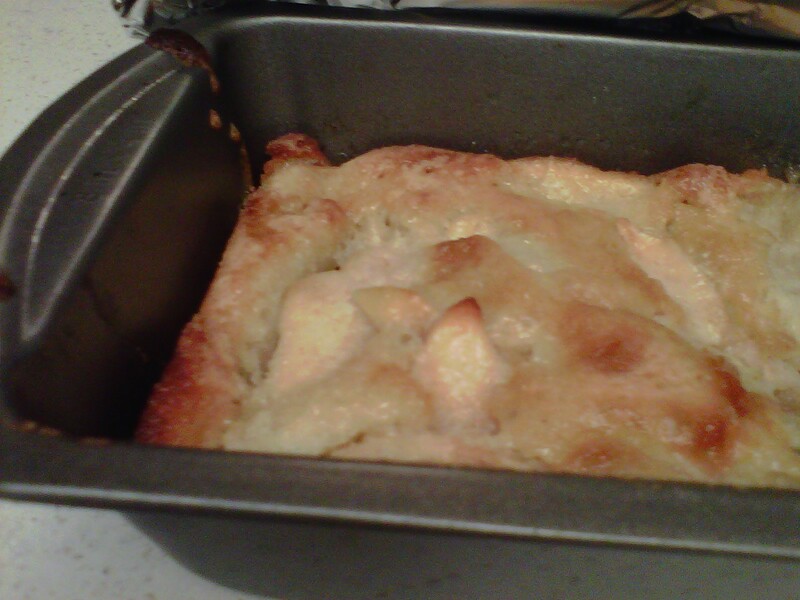 Well, I actually followed the recipe exactly this time, except I halved it, and made it in a little bread loaf pan, because I figured we didn't need cobbler leftover for days. (Especially because SOMEONE, known as my boyfriend, doesn't LIKE pie, cobbler, cinnamon, or any fruit dessert. So....it'd just be me eating it. But, Kylie loved it!! Hooray! It was super easy to make, and I actually had all the ingredients on hand already, except the 3 apples I bought. Try it out! Except, don't forget to get the vanilla ice cream at the store, like me, or you will be one sad panda...roaming around the kitchen trying to find a replacement to no avail.